Lately, we’ve been thinking a lot about which plants will thrive in a drought resistant garden here in the Pacific Northwest and also attract hummingbirds and other pollinators. There’s nothing quite like the pleasure felt while watching bees happily buzz from bloom to bloom. It’s the very reason some of us garden! Last weekend while planting in my mother’s garden I was presented with a moment of pure joy. Within minutes after digging holes for three Penstemon barbatus ‘Red Riding Hood,’ a hummingbird came whizzing by and perched itself on a nearby birch tree, eyeing the plant’s red, tubular flowers. Then it buzzed towards them and feasted on each plant while I looked on with total satisfaction. Do you want to attract hummingbirds to your garden? If so, then read on. The hum of their wings and the sight of them zipping and weaving is such a joy to experience. 1. Buy more than one feeder. 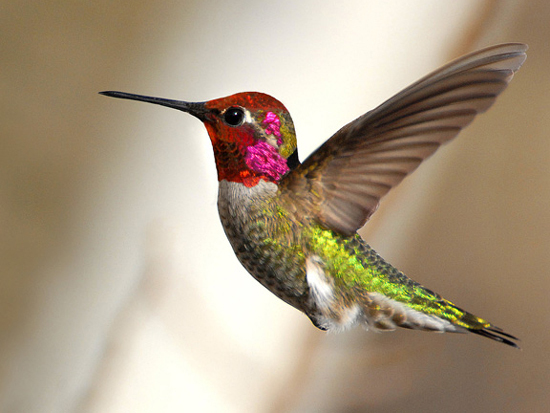 Hummingbirds can be territorial about their food sources. Having multiple small feeders placed far apart from one another may attract more birds to your garden than one large one. 2. Provide nutritional balance. Place your feeders in the vicinity of nectar-producing shrubs, vines and perennials with red, orange or red-orange tubular-shaped blossoms, with bloom times that vary throughout the year. A favorite of ours that’s not red or orange is Salvia guarantica ‘Black and Blue.’ It features striking cobalt-blue flowers, and hummingbirds, bees and butterflies love it. 3. Give them a place to bathe. Place a shallow birdbath or water feature that creates a spray or mist of water near their food source. Rocks or glass stones can be added to a birdbath so that the water isn’t too deep. 4. Consistently clean your feeders. Bacteria and molds that form in feeders can be deadly, so be sure to clean and change the solution at least once a week. When temperatures rise with summer heat, it’s a good idea to clean them every four to five days. 5. Plant native nectar plants nearby. Native plants and hummingbird populations have evolved together over time, and native plants are best adapted to our climate, seasons and soil. Ribes sanguineum (Red Flowering Currant) is a gorgeous, drought-resistant native shrub, and a magnet for hummingbirds and butterflies. It may take a month or two before hummingbirds make an appearance, but eventually, they’ll come. Log in to Facebook and let us know what you’ve planted in your garden to attract hummingbirds!